The last few posts laid out the age and education demographics of Warren, and showed what they have done to the workforce participation rate. Therefore, it will come as no surprise that these shifts have had a profound impact on the income of Warren citizens. 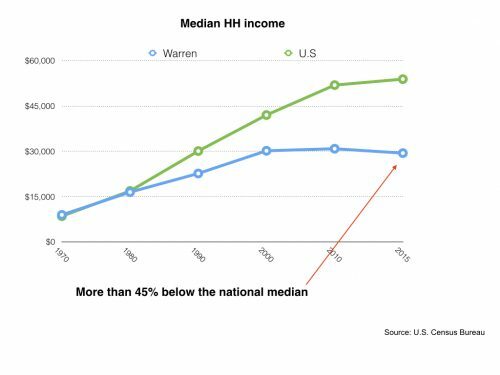 The numbers here are based on median household incomes. This is probably the most common way business and government looks at the affluence level of a community. For those of you who may not be familiar with the term, this refers to the total income, from all sources, of all the people residing in one household; that might be one person, but it might also be 2, 3 or more. The income being measured might come from a job, but it also includes investment income, any income from public assistance, or any other income of any type. Comparing Warren to the U.S. in the first chart shows that our median household income of $29,376 is more than 45% lower than the U.S, median of $53,889. Look closely at the trajectory of the lines in the first chart and you will see that we are falling farther behind with time. The rest of the country rebounded nicely from the 2008 recession, but the slope of Warren’s line turned south for the first time in the 2015 Census, dropping about $1500 per household since 2010. 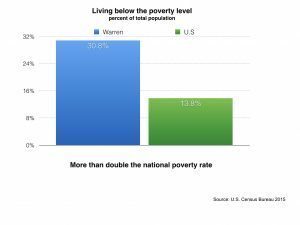 Moreover, 30.8% of Warren’s population is living below the Federal poverty line, which is more than double the national average. 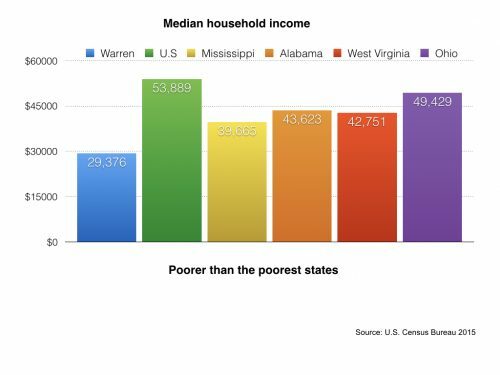 To put this in some perspective, Warren’s median household income is not only far behind that found in the state of Ohio, it is lower than those in Mississippi, Alabama and West Virginia, the three lowest income states in the Union. Comparing a city like Warren to any state is not an apples-to-apples comparison, but it probably means more to most people than looking at the numbers for some random small cities you’ve never heard of in far away states. If you want to know why Warren leads the nation in Dollar Stores per capita, one only need to look at our income numbers and trend. Posted Thursday, March 23rd, 2017 under Economic development.